Well, hello there! It's getting colder now, as we head into the depths of September and its Autumnal weather. Indeed, Summer seems like a distant memory! But, it's not all bad. In fact we love Autumn, and nothing reminds us of the reason why more than London Fashion Week (which starts tomorrow, BTW!). Fashion, fashion, fashion - September is full of it! And just to join in, we've uploaded another new A/W collection for your perusal - Vamp! Sounds intriguing, non? Vamp! 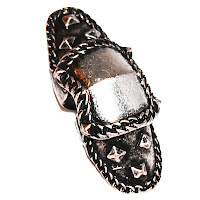 is based on the darker side of your accessory box and features gorgeously edgy, ugly, gothic, in-your-face pieces. We would go as far as to say that every outfit should be worn with at least one statement, tough-on-the-eyes, *disgusting* piece! It's the perfect collection to complement your Halloween outfit! The lady is most definitely a Vamp! 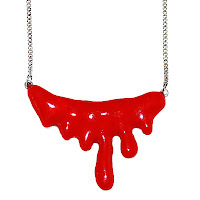 Our favourite pieces include this Blood Spurt Necklace, £12 - if we haven't sold out of this by 31st October, we'll be VERY disappointed! It's a dead cert for Halloween (get it, dead?)! This Antique Armour Full-Finger Ring, £12, is totally demanding of attention. Covering your full finger, you can notice it from miles away! Shrinking violets need not apply! 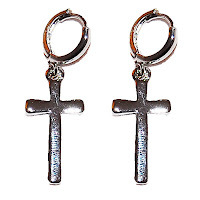 These Cross Drop Earrings, £7, believe it or not, are actually one of our more reserved pieces. Subtle, yet a great way to harden up your look! 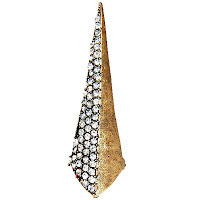 We ADORE this Gold Crystal Pyramid Long Ring, £12, and although it's positively a statement ring, we think it's actually fairly sophisticated (an adjective we didn't think we'd be using for this collection!). With its crystals and long length, it's stunning and a great piece for the upcoming party season!